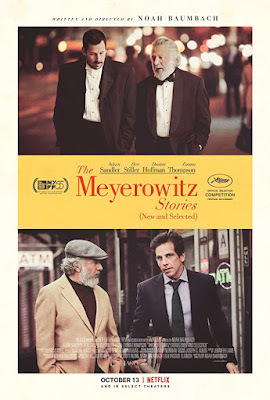 I filled in a NYFF 2017 gap by watching the MEYEROWITZ STORIES on Netflix. The story of a New York family in stars Ben Stiller, Adam Sandler and Dustin Hoffman. What keeps the film from being truly great is that the film has a New Yorker short story hipster artifice which prevented me from completely falling into it. Things are simply too neat and too perfect (including the one liners) for me to say it's real life. Lack of reality aside I loved the crisp if overly perfect dialog and the sense that we are watching wonderful actors doing the best they can.